Seeking the unstoppable entrepreneurs transforming our world. There are a lot of successful people in the world. But to build something truly remarkable, you can’t let anything stand in your way. And only a few leaders are part of this special group: the ones who never give up. Driven by their desire to better the world around them, they stop at nothing to achieve their greatest ambitions. They cut through the noise of this transformative age by breaking away from the pack — and then end up leading it. 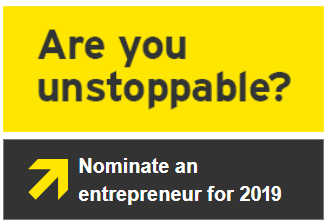 If you are an unstoppable entrepreneur or have been inspired by an innovative leader, we invite you to submit a nomination to the Entrepreneur Of The Year® 2019 program. Scroll down to learn more about the program in your market. Deadline to apply is April 22, 2019. The Entrepreneur Of The Year® has recognized the endeavors of exceptional people who create the products and services that keep our local and global economies moving forward. Since its inception, Entrepreneur Of The Year has grown and now includes programs in more than 145 cities and more than 60 countries worldwide. 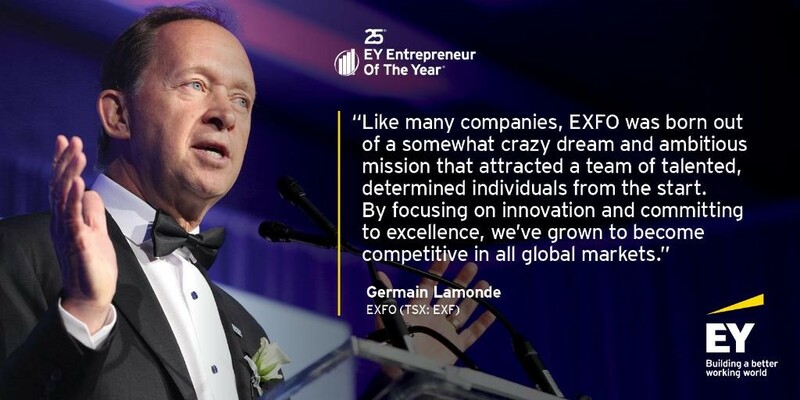 The EY Entrepreneur Of The Year Awards has recognized the achievements of Canada’s top entrepreneurs for the past 26 years. Candidates enjoy a range of benefits, including exclusive network, brand awareness, valuable publicity, stronger relationships, etc. The program offers opportunities for everyone to be involved. Nominees are reviewed by an independent panel of judges who will select finalists and award recipients based on the following criteria.